Sometimes you don’t want a permanent solution. For those occasions Liquisol developed the 3SEASONS product. Our 3SEASONS solar reflective paint is designed to be easier to remove then the 4Ever, 4Everblue and 4EverDark products. Developed and designed for locations that suffer from extremely cold temperatures in the winter months and those customers who are only concerned about solar control during the three warmer seasons of the year, 3SEASONS is ideal for those customers who want to maximize the the solar heat and light through your skylights during the cold, dark winter months while reducing it the rest of the year. The performance and appearance of 3SEASONS is similar to the 4EVER product. Like all our products the 3SEASONS is applied to the exterior surface of poly-carbonate (including Acrylic, Lexan and Plexiglas) and glass panels. The paint can applied in one or more layers with rollers or airless sprays. The paint can be removed using a mixture of water, soap and 10% ammonia. 3SEASONS dries clean and is not sticky after it dries. 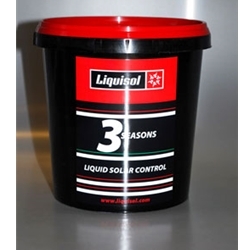 *When purchasing Liquisol 3Seasons be sure to include Liquisol sOOp cleaner to ensure the surface is properly cleaned, prepped and ready for your Liquisol application.